Moving is normally a stressful time, but choosing the right moving company will help reduce the stress and makes for a worry-free moving experience. We offer moving services that provide you with a comfortable, hassle-free moving experience. We have friendly drivers and experienced crews. All our movers are bonded, licensed and insured. Let us help you make your next move a hassle-free success! The process of moving can seem overwhelming, especially when you realize how much is involved. 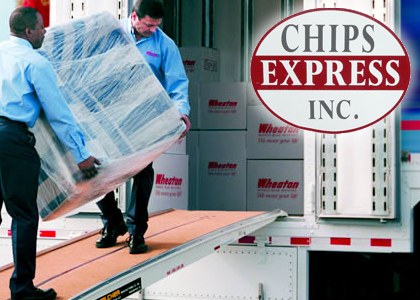 At Chips Express, Inc. , dba River Road Moving, we help people move all the time. We can make the whole process easy and convenient, whether you need moving supplies like boxes, cartons and tape or store your belongings until the move needs to be completed. The bottom line is that when you work with us, we can help provide you with resources to make your move a hastle-free move. If you are moving, hire theHASSLE-FREE MOVING Company and Relax. ★★★★★"Your company recently moved my parents from New Holstein to Kewaskum. My parents are not easily pleased and I was worried that I could not be there to assist with the communication between my parents and the moving crew. But, everything went well! My parents let me know that evening that they were very pleased and very helpful...and took care not to damage anything. Please share my thanks with these two gentlemen! I will certainly recommend your company to others in the future. Thank you again to you and the crew"
★★★★★"I seldom write letters of compliment, but after your company handled our recent move, I felt compelled to do so. Throughout my career my wife and I have moved twelve times. Some of our moves have been good while others we just try to forget. Our relocation to West Bend was handled by your company in phases over a period of twenty-two months; first moving us out of our home in River Hills into an apartment and storing the majority of our possessions in your warehouse. The second phase was to move our apartment furniture into our new home and finally the third phase was the moving of our stored belongings from your warehouse into our home. Every stage of these complicated moves was done as promised and without problems. Your employees took great care and treated our possessions as if they were their own. We give high praise to your staff, particularly Dan and Josh for their professionalism, hard work and conscientious efforts and to Barb for coordinating the whole process flawlessly. Many of our belongings were fragile and required special handling. Needless to say we were particularly concerned about the possessions that went into storage. We need not have worried, for they came out exactly the same as they had gone in. Moving is always stressful, but your company made it a positive experience. Pam and I would like to thank your entire team for a job well done; this was by far our easiest relocation and we will recommend your company to anyone considering moving." ★★★★★"Just a little “Thank You” for the wonderful service you gave us. Our move from West Bend to Aurora, IL went off very well. You all made us feel comfortable and confident. When I look at all the bins in our basement my back aches for all your many trips! We were very nervous about moving, but you made us feel very positive about this new life-changing experience. Thank you again!" - Dewitt & Nancy E.
★★★★★"We went into this urgent move with a lot of anxiety and apprehension. Fortunately, there wasn’t a confrontation, allowing for a relatively smooth event. Perfect weather reduced the stress even more. Of course, what really made the day were Dan and Jacob. "Awesome" comes to mind if I must describe their performance. Employees with good social skills are always an added plus. On December 6, 2014, with their precision moves and tireless teamwork, they completed the move to perfection. You can be assured, if ever I'm asked for a great moving company, your name will be part of that conversation. You and your staff have an enjoyable holiday season." ★★★★★"My wife and I want to thank you for a great job moving us on April 13th from Menomonee Falls, Wisconsin to Rockford, Illinois. This was our 5th move in five years, and was the best move we have ever had. From the first meeting with you until the last item was unloaded, everything was done very professionally. The moving team did an exceptional job and we were very impressed with their dedication and customer service. You folks are the best. Thanks again." - Louis & Sharon H.